Wednesday February 24 1909 I baked some bread and got along with the work all right I am making a tatting collar and cuffs for myself I read some. I had a good long letter from Lydia today. Thursday February 25 1909 I do not feel any better but manage to get through the work and do my fancy work. It keeps cold and unpleasant so I do not go out at all. Will about the place most of the time. Friday February 26 1909 I baked cookies and did other cooking. We got up earlier Will helped [illegible] take hogs to town. He then went down in the car. I had telephoned Dr Smith and he sent out some medicine for my cold. I worked on my collar & cuffs. They are nearly done. Saturday February 27 1909 Will churned for me and I baked cake before dinner. He went to town in afternoon. I finished collar & cuffs put them on my best silk waist and fixed my old brown one some. I read in the evening and went to bed early. My coughing so much makes me tired. 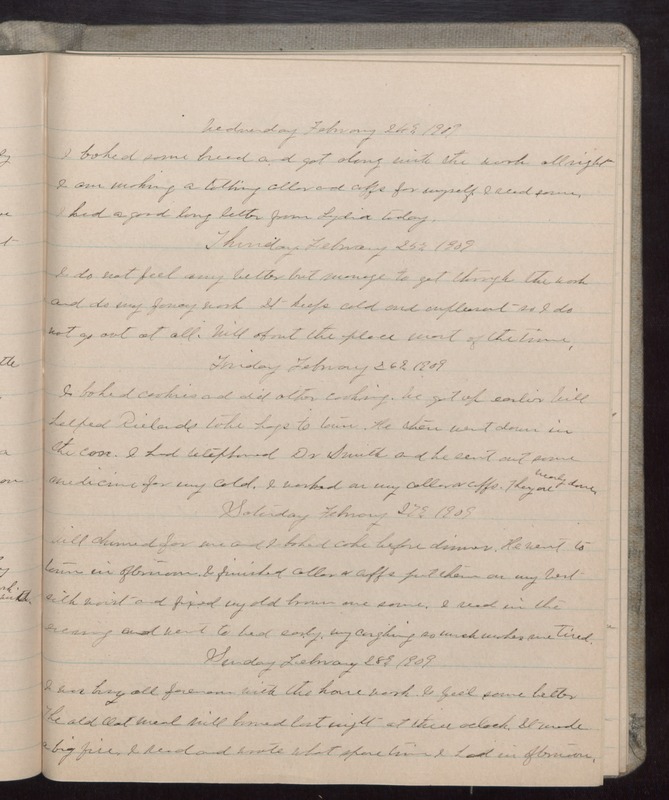 Sunday February 28 1909 I was busy all forenoon with the house work. I feel some better The old Oat Meal Mill burned last night at three oclock. It made a big fire. I read and wrote what spare time I had in afternoon.